Join Jen, ex Cirque du Soleil Fire Dancer & Coach Srikanta Barefoot & Poi Pioneer Vojta for a weekend of instruction in poi and staff. Srikanta was the first Contemporary Fire Dancer featured by the Cirque du Soleil (2007-2010), performing over 700 shows using fire poi, fire staff, double fire staff & double fire swords. He has 15 years of experience fire dancing including his position of Fire Dancing Coach and Lead Fire Dancer for Cirque Du Soleil. Jen has been teaching & performing alongside Srikanta since 2010. As a trained ballerina, she brings unique dance-based perspective to the artform. 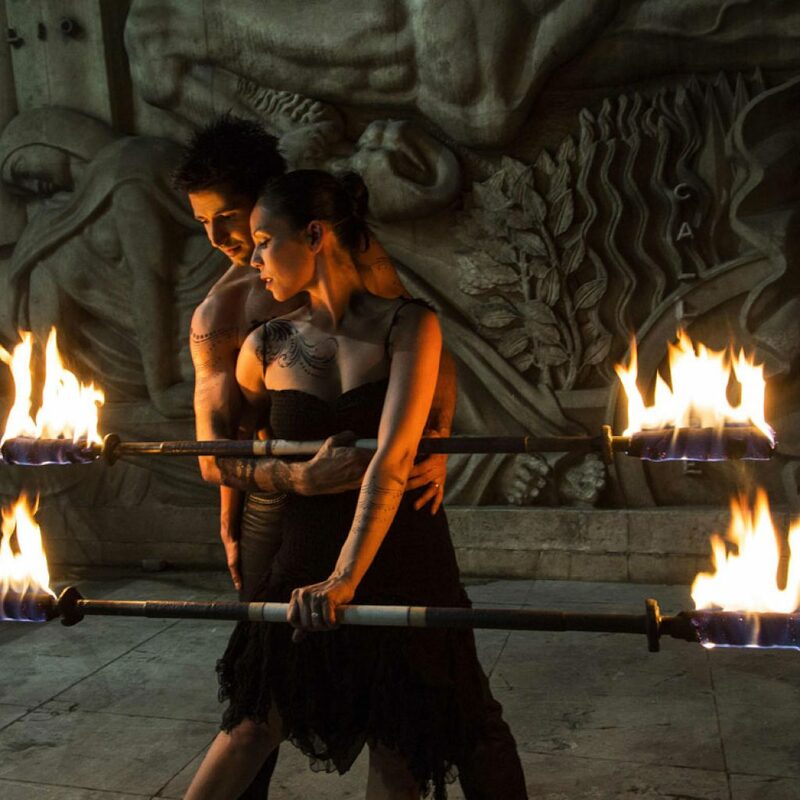 Together, the couple combine fire dance technique with martial arts, acrobatics & dance to create dynamic fire shows. Likewise, they teach their students to incorporate full-body movement, stage presence, dance & even acrobatics into their performances. Vojta is a Czech poi pioneer who excels at combining poi tech tricks with dance. With a style all his own, he has invented some innovative new poi techniques (for example, traced pirouettes variations). Vojta has shared his poi enthusiasm far and wide and taught more than a hundred workshops worldwide. 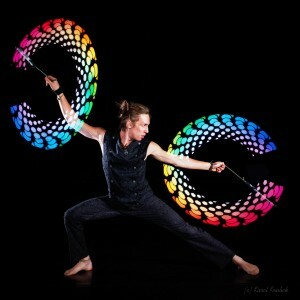 In addition, he’s filmed many inspirational poi videos, including the world’s most watched poi video “The Future Is Now”. Check out Vojta’s videos and personal website to learn more about this young, talented Artist. I’m so happy to be hosting Vojta to teach poi because for me, he represents the future of dance-based fire poi. 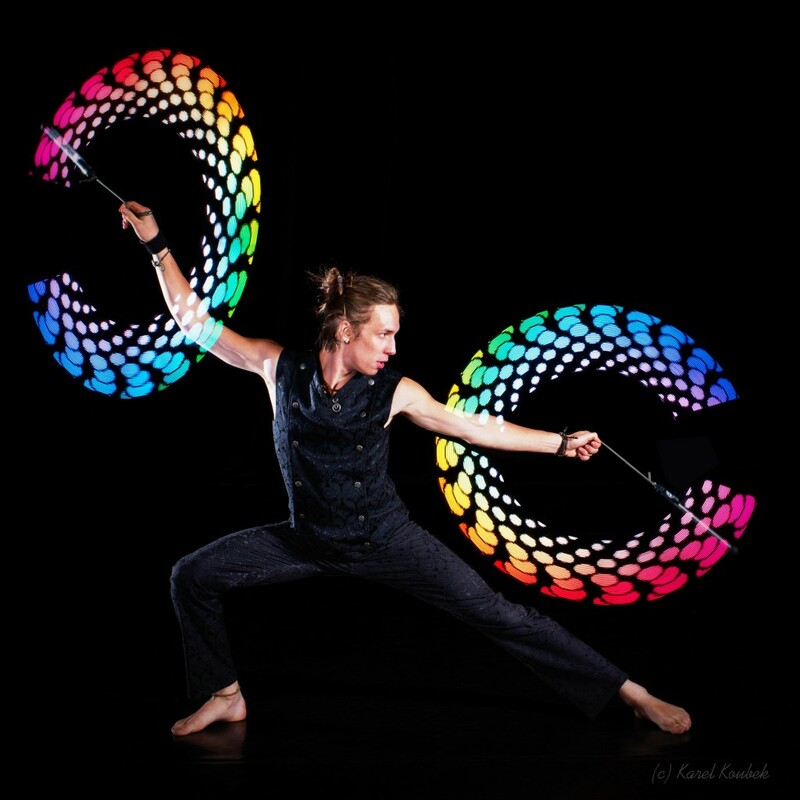 His command over technical poi moves is commendable, and the fact that he combines this with full body movement and dance puts him in a league of his own. It also means that as an instructor, he has a lot to offer, from super techy moves to jumps, turns, etc. For these reasons I recommend anyone interested in expanding their understanding with poi to learn from this unique Artist. and more if there is time! *We will be splitting the workshops into two groups and teaching the same workshop twice each day. Please let us know if you have a timing/ GROUP preference when registering. **Sundays Workshop content will build upon Saturday’s content. Consider joining us for both days! *We will meet at the bus stop on the corner & walk 1 minute to the studio. Jen & Srikanta are also available for private one-on-one or small group instruction in Paris year round. After clicking on “submit”, you will be led to the workshop payment page where you will be asked to pay a non-refundable 25eu deposit to complete your reservation. All Workshops are Intermediate Level. Please watch Srikanta’s Fire Dance Workshop Prerequisite Videos for the poi and staff before enrolling to verify that you are properly prepared for the workshop. Those who are already familiar with the patterns covered in the videos will benefit most. Those who are unfamiliar are welcome to attend so long as they are up for a high level of challenge and accept that the class may move at a fast pace. Can’t make it/ Can’t get enough? Consider joining us in Italy this Summer for a full immersion in dance-based fire dance. We’ll be doing 2 full weeks of daily poi and staff classes, nightly fire jams, adventure expeditions and more on the Volcanic Island of Stromboli: July 17-30 2016. Go to the Stromboli Fire Dance Retreat Page for videos, photos and more info.